When the weather changes, our beloved furry friends shed their coats to grow new ones. It helps regulate their temperature and keeps them happy, which we definitely want for them, but at the cost of finding hair in every nook and cranny of our home. You can try your best to brush off some of the excess, but you can never tell when you’ve missed, and despite your best efforts, there will always be more laying in wait. While these HandsOn Grooming Gloves won’t spare you from every hair, it will at least take off more than a normal wiry brush will. 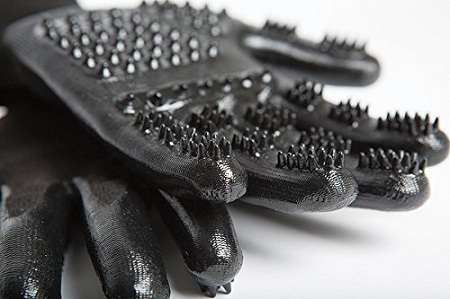 The reason being that these can be used wet or dry, won’t stick to the fur, and will feel like a massage for your pet rather than an army of spikes raking across their body. This also allows you a lot more control in the amount of pressure you use, so you can brush faces, hands, and other tight body contours without jabbing them with a plastic paddle. These are made of a material that won’t crack, tear, or mildew (if you store them properly after use), and are very lightweight. Since they are gloves, you also don’t have to worry about them slipping off your hand when washing or grooming larger animals like cows and horses. You’ll be looking at paying around $26 for these, and will have to check out the size chart as they come in small, medium, and large.